Dr. Woo Paik is President and Chief Technology Officer (CTO) for LG Electronics. Returning to this position in January 2008, Dr. Paik is responsible for technology innovation in LG’s four core business areas. Known throughout the industry as the “Father of HDTV,” Dr. Paik is the head of the CTO organization at LG Electronics headquarters, which is comprised of 10 R&D institutes with 3,800 engineers and five corporate staff organizations. He is also responsible for directing all of the company’s R&D activities, encompassing more than 15,000 engineers worldwide. worked as President and CTO of LG Electronics for the seven years from 1998. 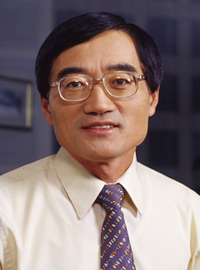 Prior to joining LG Electronics, Dr. Paik was Executive Vice President, Technology for the General Instrument Communications Division (now the broadband division of Motorola) until 1996. He led the Advanced Development team that vaulted General Instrument to the forefront of digital television technology. His team developed the DigiCipher HDTV system in 1990, which is the world's first all-digital HDTV system. He later worked as a key member of the Grand Alliance Technical Oversight Group (TOG) and various Technical Specialist Groups that developed the U.S. HDTV broadcast standard. He also applied the DigiCipher technology for multichannel NTSC system, which now has been commercialized and deployed in satellite and digital cable systems in U.S.
Dr. Paik worked at M/A-COM in 1978, later becoming one of the founders of the VideoCipher Division of General Instrument. He is one of the key inventors of the VideoCipher II system that became the de facto standard for the C-Band satellite video encryption system and is still in use by most cable programmers including HBO, Showtime, CNN, ESPN, Disney, and others. He also briefly served as Senior Vice President, Technology for Qualcomm, Inc. after he left General Instrument. Dr. Paik’s contributions to digital TV have been recognized through numerous awards and honors. He was inducted into the Consumer Electronics Hall of Fame and the Academy of Digital Television Pioneers, in 2004. He received the Digital Television Pioneers Award from Broadcasting & Cable Magazine in 2000, the Arthur C. Clark Award from the Satellite Broadcasting and Communications Association in 1999, a technical Emmy Award from the Academy of Television Arts & Sciences for his outstanding digital television achievements in 1996 and the Matti S. Siukola Memorial Award from the IEEE Broadcast Technology Society in 1991. Dr. Paik earned his doctorate in electrical and electronics engineering from the Massachusetts Institute of Technology, and his masters and bachelors in engineering degrees from Seoul National University. He is the author of numerous technical papers and co-inventor of more than 25 inventions earning U.S. Patents in the area of digital video compression, digital transmission, and digital signal processing.